The days are shorter and sometimes colder and sometimes wetter these days. All of this makes it a great time to read about going outside with kids. Here are some of my favorites. But before we jump into this, please know that I'm not much of a book reviewer. Critical analysis of books has never been my thing. So don't expect anything too eloquent or deep here. 1. 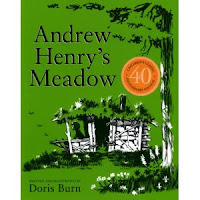 Andrew Henry's Meadow by Doris Burns. By far my favorite. I've read this book over a million times and love it more each time. The parents are no role models but the imagination and purity of the kids are just awesome. It's not available on Amazon so buy it through San Juan Publishing (scroll down on this page till you see it). I'm also especially attached to this book because we bought it on Orcas Island a few summers ago and Orcas Island in the summer is heaven and anything purchased there is perfect. 2. 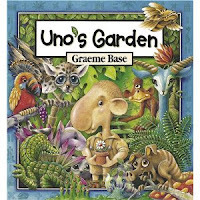 Uno's Garden by Graeme Base. This is a new favorite of mine and, like Andrew Henry's Meadow, it is hard to find online. All of Graeme Base's books are amazing - The Legend of the Golden Snail being my other favorite - and his website is super fancy. He's one creative dude. Uno's Garden is a tale of biodiversity loss (did I lose you with the word "biodiversity"??) and how kids brought us back to a balanced world with animals and plants and all the things we need to actually live. Finding the snorklepig is what my kids focused on so you can disregard my mention of biodiversity. 3. The Curious Garden by Peter Brown. I'm a little biased on this one because I explored the High Line in New York City before it was legal (Mom, if you're reading, cover your eyes). But that aside, it's a great story about connecting with nature even in a big dreary city. Liam discovers something one day and gets into it and within a few seasons he has followers and eventually the whole city is changed for the better. I don't want to get political here, but Liam's infectious passion reminds me of this recent video of President Obama addressing his campaign headquarters after the election. You never know what impact you might have in this world. 4. How Groundhog's Garden Grew by Lynne Cherry. These next two are about gardening. In this one, Groundhog learns from his friend Squirrel how to garden. It's based in a climate not at all like ours in the Bay Area so you have to overlook the whole hibernating and snow thing. But this is a great book to read as you garden with your kids... or if you don't have a garden but want to teach them about it anyway. I love the illustrations and the step-by-step explanations of how plants go from seeds to plant to your table. 5. Winnie Finn, Worm Farmer by Carol Brendler. I estimate that I've read this book 48 million times. My kids love this book and choose it over and over again for our bedtime story. Winnie Finn is earthworm crazy, as the book begins, and this is the story of how she uses worms to get herself a brand new wagon to pull her wacky cat around in. I love this book because we have a worm bin and so it connects a bunch of dots for my kids. It also talks about poop which any 3 or 6 year old boy will appreciate (is that a gender thing? and will the out grow it? say yes). What books do your kids like about nature and the great outdoors? Please share in the comments.